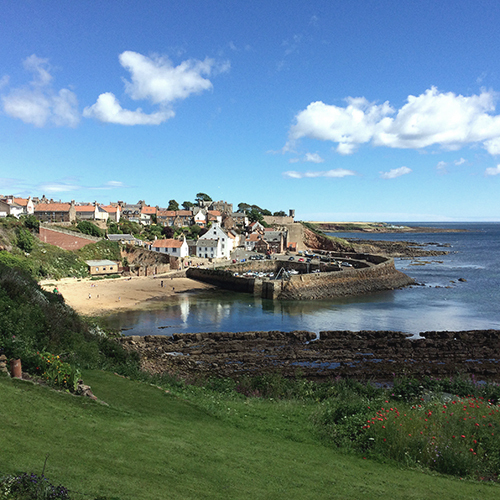 43 Shoregate is located at the harbour in the picturesque village of Crail in the East Neuk of Fife and provides very comfortable self-catering accommodation for up to 6 people. The beautiful traditional pantiled harbour-side cottage is situated in a small courtyard with superb sea views over the Firth of Forth towards the May Island and the East Lothian coast line. Four of the six rooms have sea views and the house also looks over the beach which is literally a stone's throw away. Please put the cursor over the picture to the right to see where the house is located. The cottage is available throughout the year. Prices range from £300 to £710 per week depending upon the time of year; we also do short lets. Please check availability and prices using the search below. It is well situated as a base for exploring the surrounding area, walking (Fife Costal Path) or just as a place to relax! Crail is 55 miles from Edinburgh and 10 miles from St. Andrews. Within this website you will find information about the house, the surrounding area, availability, the rental charges and contact details. If you have any queries please do not hesitate to contact us.